Did you know that cashews grow on trees? 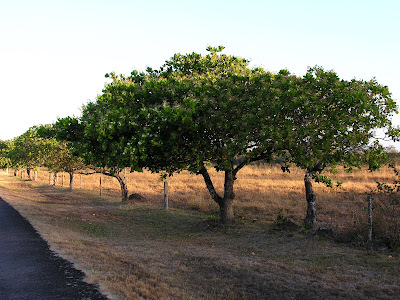 Cashew trees grow in many tropical areas in South America, Asia, and Africa, but are native to Brazil. The trees are medium in size (growing to about 10 to 12 feet) and the flowers on the tree are usually pink to dark red. Though cashews are usually referred to as nuts in the culinary world, they are in fact fruits. There are two parts to the "fruit" of the cashew tree. 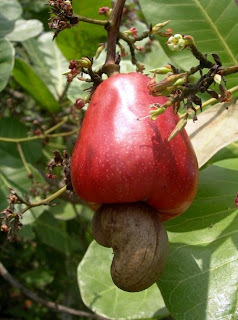 The cashew "nut" or kidney shaped seed is the true fruit of a cashew tree and forms first. It is covered with a hard shell and inside there is a single seed, thereby making it the true fruit. The shell of a cashew has a resin in it that is a skin irritant. The oil contained in the resin is the same as the oil that is found in poison ivy, making the cashews difficult to harvest. In many places the cashew is thrown away and it is the "cashew apple" that is coveted. However, in Brazil they have a highly advanced harvesting industry where the nuts are safely shelled. What appears to be the fruit is the "cashew apple" which forms in between the "nut" and flower. This apple is known as an accessory fruit, which means that the tissue is formed not from the ovary, like the cashew itself, but from another part of the plant. Other examples of accessory fruits are pineapples, figs, and the fleshy parts of pears and apples. (The core is the true fruit for apples and pears.) 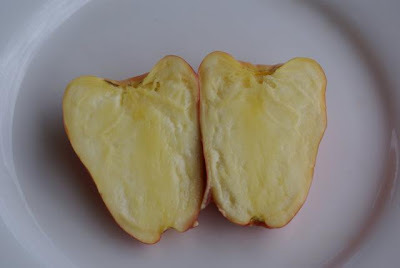 In the picture below the cashew apple has been cut open. Notice that there are no seeds in the cashew apple. The cashew apple has a sweet taste and is used in many different ways. The apple and cashew fall from the tree when they are both ripe and the apples must be harvested quickly from the ground as they will spoil within one day without refrigeration. The "apples" are most often used for their juice as the fruit is very fibrous. The fruit is chewed for refreshment and then the pithy residue is discarded. The juice is also used to make a variety of beverages from carbonated drinks to wine and distilled liquors. The cashew apples are most often red or yellow. Some fruits even exhibit both red and yellow colors on one fruit! Great info! I have enjoyed cashews for years without really knowing where they came from. 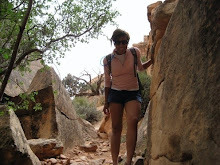 Thanks for helping me resolve one more questions as I confront my "Omnivore's Dilemma"!